On a three day visit to India for the first time, the American President Barack H. Obama met the Indian Prime Minister Dr. Manmohan Singh in New Delhi only to reaffirm shared values and increasing convergence of interests between the US and India. When the world’s oldest democracy reaches out to expand and strengthen global strategic partnership with the world’s largest democracy, it can only be a good thing for the world. The two leaders welcomed the completion of steps by the two governments for implementation of the India-U.S. civil nuclear agreement. They reiterated their commitment to build strong India-U.S. civil nuclear energy cooperation through the participation of the U.S. nuclear energy firms in India on the basis of mutually acceptable technical and commercial terms and conditions that enable a viable tariff regime for electricity generated. While there is a major concern from sustainability perspective, on the use of nuclear energy for powering the nation, agreement on clean energy also part of the US Prez’s trip to India. The US signed a Memorandum of Understanding with India for an India-US Clean Energy Research and Development Centre. The Centre will involve active participation of academic and private sectors of both countries working in a consortia mode. 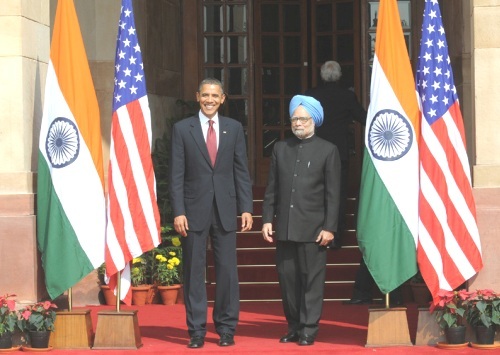 The consortium will be self-selecting teams with entities or individuals from national labs, academic institutions, private sector, NGOs etc and bring together talent from both countries This was first agreed during Prime Minister Singh’s state visit to Washington in November 2009, but President Obama’s this visit to India only accelerated the process of this initiative to proceed to the next level. The initiative is launched with a view to create a clean energy economy for the 21st century with the main focus being wind and solar energy. The successful working of this initiative will enhance both the countries with new economic opportunities for their people as well as create new jobs in the clean energy sector. On international climate change negotiations within the United Nations Framework Convention on Climate Change (UNFCCC), Prime Minister Singh and President Obama reiterated the importance of a positive result at the forthcoming UNFCCC conference in Mexico and affirmed their support for the Copenhagen Accord. To that end, the leaders welcomed enhanced cooperation in the area of climate adaptation and sustainable land use, and also welcomed the new partnership between the US and India on forestry programmes and in weather forecasting. Mobilizing private sector expertise and resources on energy related issues in both India and U.S. In addition President Obama led a US-India Innovation Roundtable with a group of India and US based private sector executives whose respective partnerships are creating jobs in the US and improving quality of life for millions of people in India.